Blissful Hiking Wants to Present at Your Library, School, or Hiking / Outdoor Club! Email: blissfulhiking(at)gmail(dot)com for informational handout on programs, testimonials, and what I can offer you! Motivating Talks and Demonstrations for your Group! 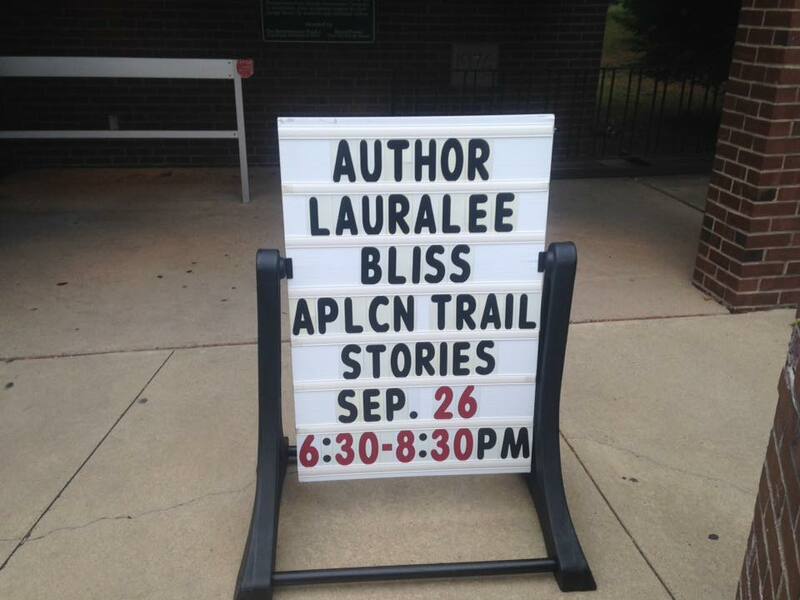 Lauralee will present to elementary school assemblies, libraries in multiple states, outdoor groups, outfitters, women's groups, school groups, Scouting groups, church groups, etc. 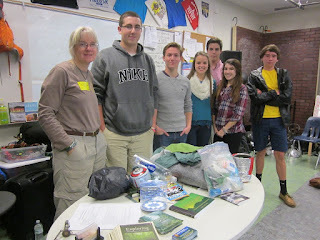 Motivating presentations include PowerPoint presentations, sample backpacking gear, and an information station. Elementary school assemblies feature onstage media, a campsite set, and a visit (or two or three) by Sammy, the shy but hungry bear! Lauralee also conducts half or all day workshops to get down to the nitty-gritty of backpacking and thru hiking, including media and hands-on demonstrations (including dissecting a backpack, hiker nutrition and cooking, water purification, gear options, safety and first aid). E mail blissfulhiking(at)gmail(dot)com for details. NEW - "The Ranger and the Bear - An Appalachian Trail Adventure for Kids" - perfect for libraries and elementary school assemblies. We also tailor the program to fit the summer library reading program. Lauralee talks about hiking to children, caring for the woods and wildlife, and a visit with Sammy, the shy but hungry bear. Multimedia and hands-on activities for libraries, full onstage presentation for school assemblies. 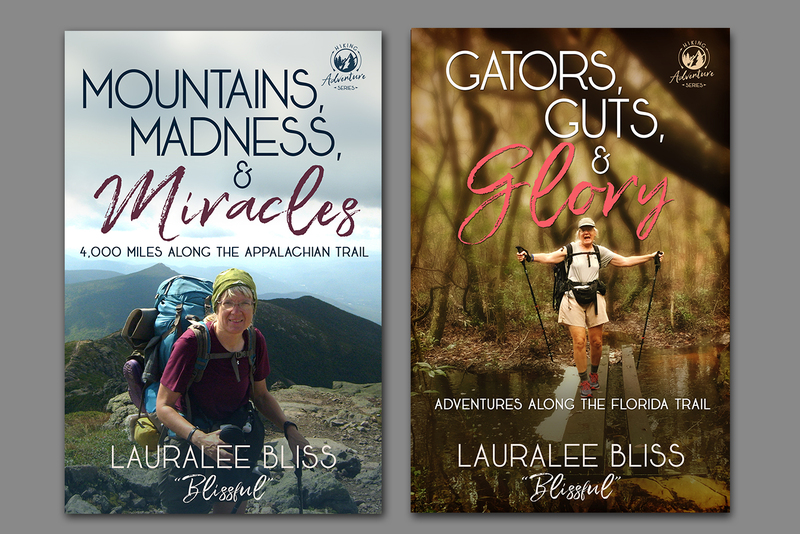 "Mountains, Madness, Miracles - 4000 Miles of Appalachian Trail Stories" - Lauralee shares her epic 4000 Mile Journey. Also offers a book signing. Popular with libraries! “Women's Backpacking” – tactics for the woman hiker including the mental, physical, and emotional challenges. This can be expanded to include basics on up to in depth talks on gear and women specific issues, shake down of participants' packs, etc. 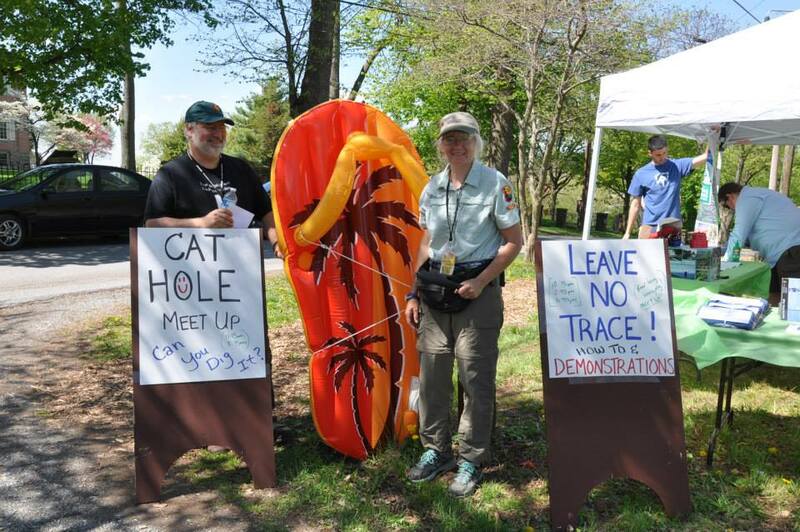 Presented numerous times for outfitters and trail organizations. “I Dream of the Appalachian Trail” – what it takes to accomplish your dream hike of the AT. “4,000 Miles of Miracles" – using Scripture, testimonies from her hikes and pictures, Blissful paints a portrait of a loving God through the miracles she witnessed on her many adventures. This presentation will bring one closer to God with the realization of how much He cares about the big and small things we endure. Great for church groups, teen challenge groups, etc. - "pictures were beautiful, very inspiring talk"
- "a lot of information"
- "inspiring to me at age 46"
- "laid everything out about female issues and safety"
- "knows all subject matter and well presented with photos"
- "straight talk about female issues"
"Lauralee’s presentations on AT Thru-Hiking and Long Distance Hiking for Women have consistently been full to capacity because of the wealth of knowledge she provides and how she consistently presents it. Her presentations leave hikers with a longing for the thru-hike and the lifelong rewards it provides." "We are so happy to hear of your experiences on the trail. For many who will never be able to do it, you provide the virtual Thru Hike!" "Lauralee Bliss's presentation was engaging and delightful. Based on the abundant positive feedback we've received since the program, Lauralee's talk was interesting and inspirational - well worth listening to! Include your phone number so we can connect. Reasonable speaker and workshop rates. 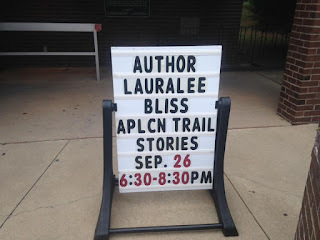 Lauralee Bliss (trail name Blissful) is a noted 4,000 miler through the Appalachian Trail Conservancy, completing the Appalachian Trail both north with her teen son and south as a solo hiker. Other hiking credits include the Florida Trail, Colorado Trail, the Long Trail, the Foothills Trail, the Allegheny Trail, the Massanutten trail system of VA, and all 500 miles of side trails in Shenandoah National Park. 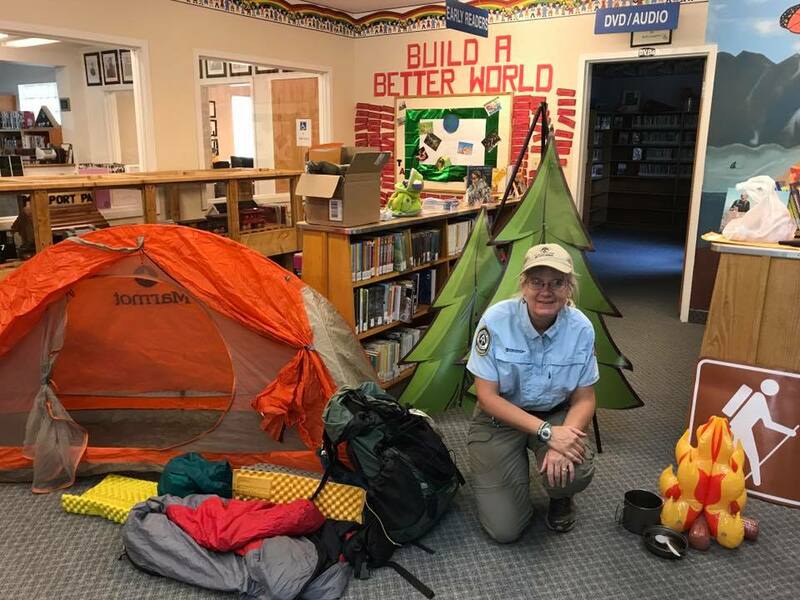 She served five years in Shenandoah National Park as the ridgerunner where she brings to life a new program - "The Ranger and the Bear" presentation designed especially for elementary assemblies and children's libraries! Lauralee brings a vast wealth of knowledge spanning over ten years of backpacking in multiple states and also worked six years on the Appalachian Trail assisting hikers. Her desire is that everyone, young and old, fulfill their hiking dream. My books are available on Amazon! 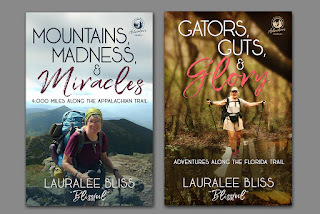 Lauralee is also the founder and administrator of the popular Facebook Groups Appalachian Trail Section Hikers and Shenandoah National Park Hikers and is the author of Mountains, Madness, Miracles - 4000 miles Along the Appalachian Trail. Coming in July - "Gators, Guts and Glory - Adventures on the Florida Trail." Need a guest blogger for your outdoor / hiking blog? 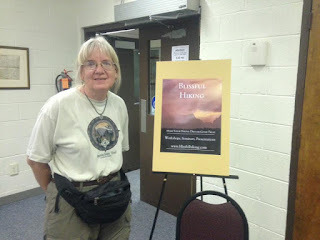 Please e-mail me at: blissfulhiking(at)gmail(dot)com to discuss topics, rates, etc. 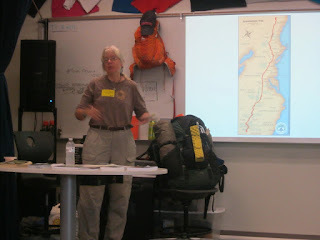 I can cover a variety of topics having to do with hiking the Appalachian Trail and general backpacking. I also cover gear and other backpacking topics.